← Restoration progress: Corbels up! From tiny seeds . . . . 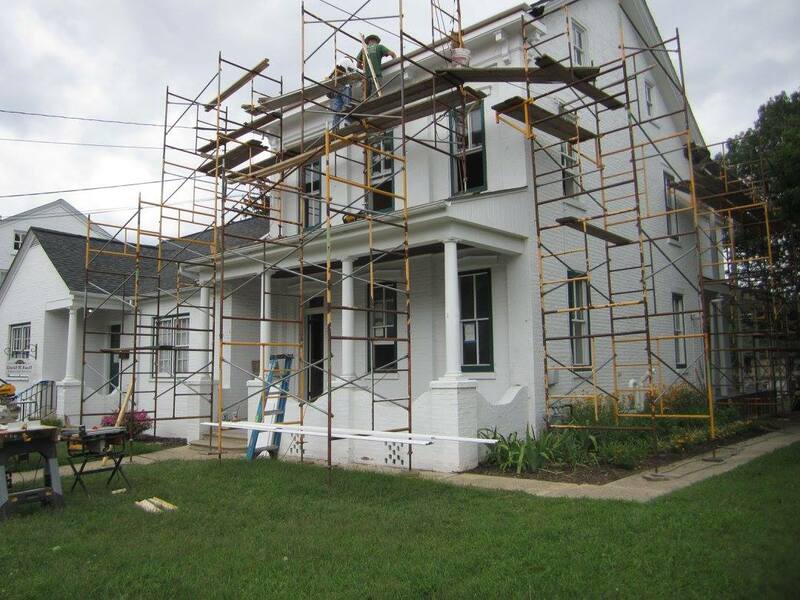 Earlier this week a Reading Eagle reporter contacted John Updike Society president James Plath asking for help updating the story of The John Updike Childhood Home restoration. Plath passed along his email response and also the phone number for tenant/docent Dave Ruoff, whom he thought would already be on site to let the photographer in to take interior photos. It was intended as a space-filler story, a hurry-up piece for the next day’s paper, but the article by Ron Devlin, with photos by Harold Hoch, filled almost a whole page. Then the Associated Press picked it up, and the following day JUS board member Biljana Dojcinovic reported that the Serbian news service printed a story on it. Since Biljana is directing the June 2018 conference in Belgrade, of course she took the opportunity to share information about the upcoming Updike conference. Obviously there is still great interest in John Updike, and the society is excited to finally see the restoration coming to an end, and the next chapter—turning the house into a museum and literary center—beginning. The society is hoping that people who purchased items from the Linda Updike auction at the Plowville farmhouse will contact James Plath (jplath@iwu.edu) about a possible donation. The society is a 501 (c) 3 non-profit organized for educational purposes, and your donation is fully tax deductible . . . plus, the names of donors will be recognized permanently with the exhibits, and all donations valued at over $1000 will also land the donor on the donor tree wall that is planned for one foyer wall. Because the house is also significant to Shillington history— borough founder Sam Shilling had the house built for his son in 1884, presumably as a wedding present—the museum will also celebrate Shillington and the importance it and Reading and Berks County held for Updike, and the influence it had on his work. The society is especially looking for a round oak clawfoot dining room table and chairs from the turn of the century, as well as an upright Chickering piano.